Maintaining its real-world focus, Glencoe Accounting - Advanced Course is designed for both college bound and vocational students alike. 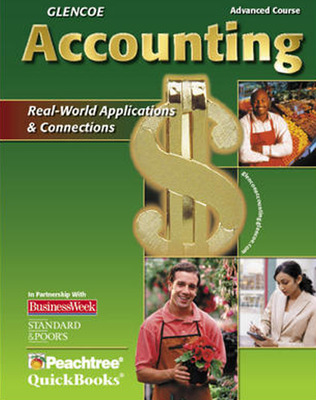 Glencoe Accounting Real World Applications and Connections - Advanced Course is the ultimate school-to-career connection! This program builds on the content presented in the First-Year Course. Maintaining its real-world focus, this course is designed for both college bound and vocational students alike. Students will continue to develop their skills in the real world of accounting software, through the integration of Peachtree and QuickBooks throughout the text as an essential part of this program. Software tutorial directions are included at the point of instruction for each application.